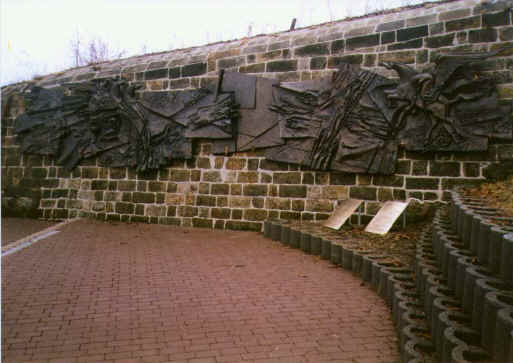 The Strehla Memorial Park in Strehla, Germany, is on the bank of the Elbe River at one of the three sites (the others being Torgau and Clanzschwitz) of the historic first meetings of the Russian and American armies on April 25, 1945 - "East Meets West". The Memorial includes a 10-by-35 foot stone wall erected by the German people on land donated and maintained by them, including a stone border, flowers and shrubs. Attached to the stone wall is a 7-by-21-foot bronze artwork and casting created by a Russian sculptor, Vladimir Surovtsev, in honor of his father who was killed in WW II. The theme of the Memorial was decided after consultation with a small group of American members of the 69th Infantry Division (who pushed for the Memorial without financial assistance from the 69th Infantry Division Association, Inc.), Russian members of the 58th Guard Division, First Ukrainian Front, and a group of citizens from the town of Strehla, Germany. It shows Pegasus, a mythical winged horse with its rider picking up the spirit of the slain heroes and carrying them back to Heaven for eternity. 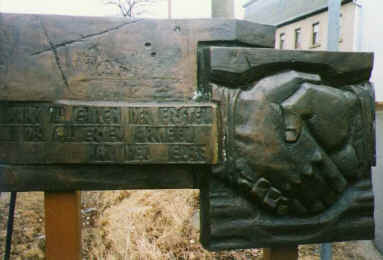 The Strehla Memorial Park was built entirely using individual donations. It was dedicated in a ceremony on April 25, 1995, exactly 50 years after the historic meetings. 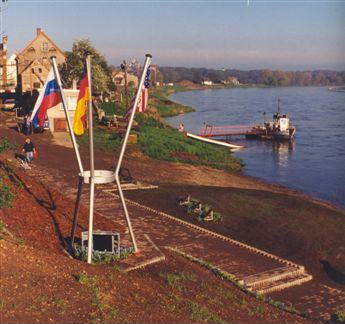 View of the Strehla Memorial Park overlooking the Elbe River with the Three People's Flagpole in the foreground from where the American, Russian and German flags fly. The unique flagpole was designed by Sam Lewis, Company B, 273rd Infantry Regiment. 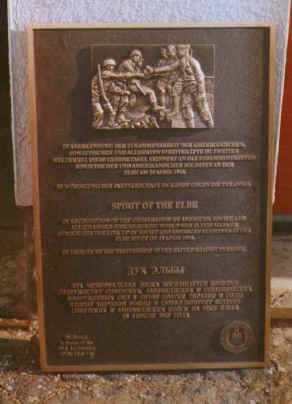 At the dedication on April 25, 1995, four of the prime movers in the small group formed to push for the construction of a memorial. From left to right: William R. "Bill" Beswick, Company B, 661st Tank Destroyer Battalion; William E. "Bill" Snidow, Company B, 661st Tank Destroyer Battalion; Dillard M. Powell, Anti Tank Company, 271st Infantry Regiment; Edgar A. "Bud" Parsons, Company A, 272nd Infantry Regiment. hands on meeting at the Elbe River. Close-up of art-work and casting showing Pegasus and rider.